Jews eat foods that reflect the significance of a holiday—such as matzah on Passover and apples dipped in honey on Rosh Hashanah—and Chanukah is no exception. For at least the last thousand years, Jews have traditionally eaten oily foods on Chanukah. You can also make latkes with cheese, carrot, zucchini or just about anything else that fries well. In fact, eating jelly doughnuts (sufganiyot in Hebrew) on Chanukah is a very close cousin to this custom, sharing the same source (see our sufganiyot recipes). 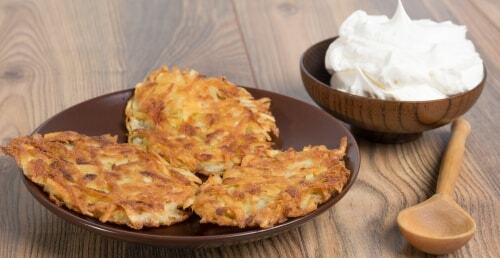 Check our curated collection of the most amazing latke recipes, guaranteed to satisfy even the most discerning palate. Potato latkes are traditionally served with applesauce and/or sour cream, but they are perfectly tasty with nothing at all (please, oh please, do not disgrace them with ketchup). servings while I don't know of a recipe conversion site offhand, if I were you I'd triple or quadruple the recipe for the amount of people you'll be hosting. 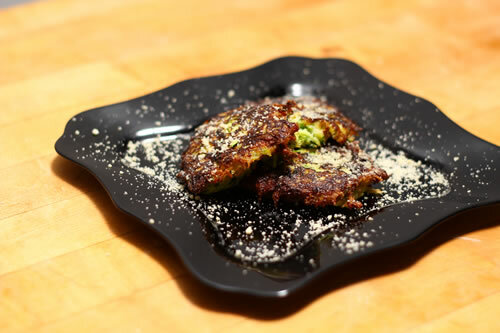 Potato latkes go like hotcakes usually as they're delicious! Just a tip: use olive oil! latkes i also will be making my first latkes. i have tasted them previously and now wish to do my own.